Weather is most critical in determining the colors displayed each fall. Colors are best when high quality foliage - a product of a warm, moist summer - is exposed to sunny, cool fall days. Light frosts may also help, but hard freezes can ruin the display. 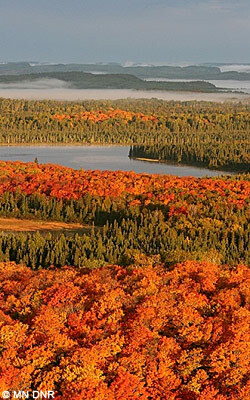 Physiological stresses placed on trees can impact fall colors. 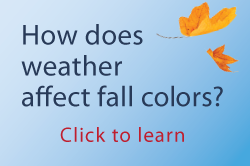 Cool, wet summers can cause premature displays of color. A mild summer drought may actually increase the display, but severe drought usually dulls colors noticeably. In some cases, foliage may die early and turn straw-colored due to a lack of water. The slightest changes in weather in September - too warm, too cold, too wet, too dry - can slow color change or cause trees to drop leaves before they change color. Because it is too dry to produce the vibrant reds, yellows, and oranges, a severe summer drought will create a landscape filled with the subtler colors of tans, bronzes and auburns. Each has its own color and chemistry. As the amount of these chemicals vary, they will cause subtle variations in color from one leaf to the next, or even from tree to tree. The green color that we see on most plant leaves throughout the spring and summer is caused by a pigment called chlorophyll. Chlorophyll is one of several pigments that gather energy from sunlight in the process of photosynthesis. Chlorophyll absorbs both the blue and the red wavelengths from sunlight, and reflects the green wavelengths. Nitrogen is one of the main components of chlorophyll. As our days shorten and temperatures get cooler, chlorophyll is broken down faster than it's produced. The majority of the nitrogen migrates back to the twigs, where it is stored for next year's new growth. As chlorophyll breaks down, the carotenoids are revealed. Many of the yellows and oranges we see in nature are the result of carotenoid compounds. They are what make carrots orange! Carotenoids play a minor role in photosynthesis—they are present throughout the growing season, but are only revealed when chlorophyll breaks down. You are more likely to see brilliant colors when the fall weather has warm, sunny days with cool nights between 32° and 45 °F. Look at a leaf that has been grown in the shade, and you may notice it is a duller color than leaves that grew in the full sun, even on the same plant. The reds and purples you see in the fall are caused by anthocyanins, which are what you get when sugars combine with compounds called anthocyanidins. Many things affect the exact color produced by anthocyanins, including the pH (acidity or alkalinity) of the cell sap in the leaves. With an acid pH, anthocyanins are often red; with a more alkaline pH they turn purple-to-blue. Because anthocyanins need sugar for their creation, weather that favors photosynthesis (sugar production) is essential. Bright, sunny fall days produce the best colors. Very little photosynthesis occurs on cloudy days, and rain can actually leach the anthocyanins and carotenoids out from the leaves. Different combinations of anthocyanins and carotenoids can result in there being yellow, orange and red leaves all on the same tree at the same time. The exact color a tree produces will vary from year to year. Some people believe they can force a more brilliant red color by adding acid-forming fertilizers to the tree, especially aluminum sulfate. This method may sound like it should work, but there is no scientific evidence to support it. In many forests, oak trees don't add much to the collage of fall colors. They often just turn brown, thanks to a group of compounds called tannins. Tannins are revealed when both chlorophyll and carotenoids break down in the leaves. Some oaks do produce a light red or pink color in the fall, but our native bur oak does not. Not all conifers are evergreen! Some change color and lose their needles in the fall. Many conifers—including spruce and pine trees—naturally shed their older needles every year (the needles toward the plant's interior), and it's perfectly normal. Larch trees are unique among the conifers in that they lose all of their needles every year. They are "deciduous evergreens." The needles turn a bright golden yellow and are beautiful to observe as they float lazily to the ground. Credit: Joe Zeleznik, Extension Forester, North Dakota State University. 2007. Fall Colors of North Dakota. Pages 15-16 in North Dakota Climate Bulletin.